The British pound against the US dollar continues to move within a narrowing lateral trend. 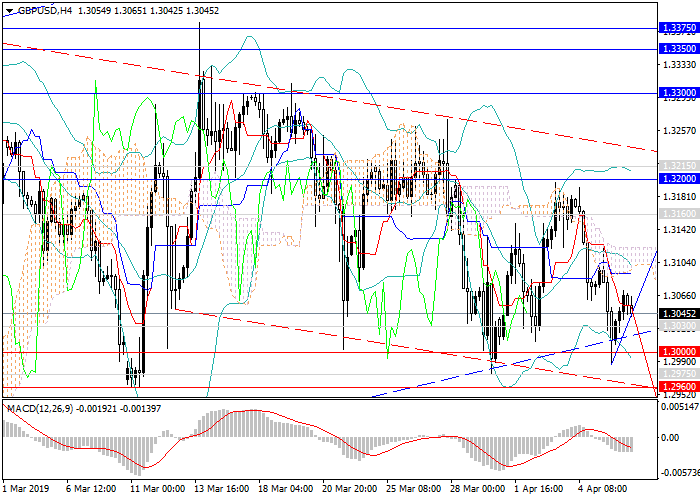 On Friday, the pair reached a key support level of 1.3000, but, again failing to break it down, corrected upwards. The current lateral trend is due to the ambiguous situation around Brexit: almost every week the UK government gathers for discussion, but concrete decisions have not yet been determined. However, data on key sectors of the economy of the United Kingdom indicate an acceleration in the growth. The dollar also can not determine the direction of movement amid the release of ambiguous macroeconomic data. Last week, USD was pressured by weak labor market data, before that – by a decline in GDP. Despite a weak dollar, the pound cannot get enough investor support to move to growth. Perhaps investors are more cautious in anticipation of decisions that may significantly affect the economy. In the long term, the pair will remain within the ascending channel. The change of direction is possible only in the case of taking key support levels of 1.3000, 1.2960 and consolidating below them. Technical indicators on H4 and D1 charts changed the direction to the downward one: MACD indicates the growth of the volume of short positions, and Bollinger Bands are pointing downwards. Support levels: 1.3030, 1.3000, 1.2960, 1.2940, 1.2855, 1.2775, 1.2700, 1.2640. Resistance levels: 1.3160, 1.3200, 1.3215, 1.3300, 1.3350, 1.3375. Long positions may be opened from the current level with the target at 1.3200 and stop loss at 1.2950.